Two days after the storm. Driving to the mountain from the south, it appeared to have no clouds [inversion layer?]. Once in Wrightwood, it became cloudy (obscured) and remained so until Vincent Gap; where I could see the lower elevations of the north sides of Baldy and Pine mountains held clouds and the upper elevations didn’t. The clouds must have just burned off BP. Snow at lower elevations (6500’–8000’) was gloppy, heavy, and melting quickly; while upper elevations (> 8000’) remained dry, and light. By 9:00 even in shady corners, there was no ice on the road but plenty of water; indicating temps hadn’t dipped too far below freezing. 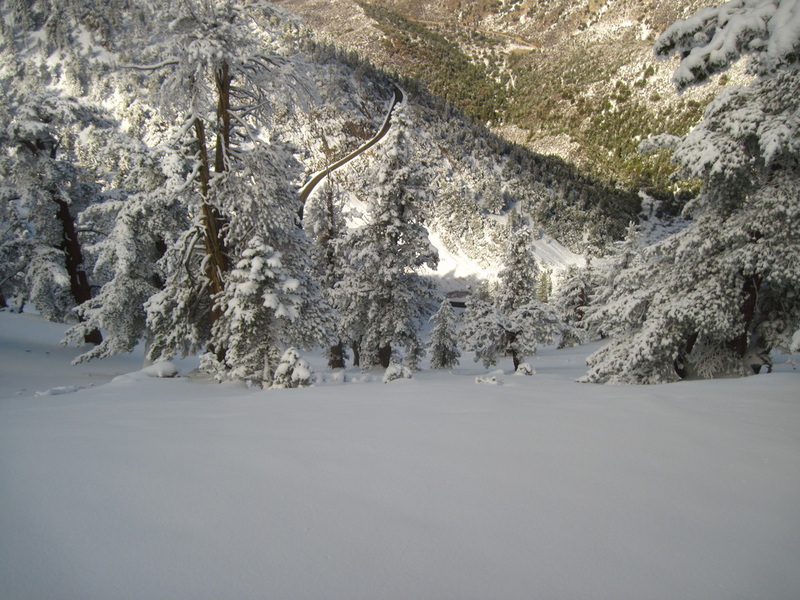 Vincent Gap (6500’) had 2–3” of heavy snow, depending on the aspect. The trail well established by hikers with crampons and Yaktrax. Until Lamel Springs (7800’), Eastern aspect snow was melting fast but NE & N aspects held. From Lamel Springs on, snow covered the trail all the way to the summit. The trail area (8000–9200’, N & NE aspects) had 4–8” of fluffy pow. The N/S ridge from 8800’ up to 9200’ was not as wind scoured as Throop the day before; good for hiking, bad for sliding. Once at the “Tree Line” (9240’) serious wind drifts developed. Wind blew up from Mine Gultch and deposited snow—knee-deep—onto the trail along the ridge and N face of BP. Where the PCT turns off (N aspect, 9250’) we got cauliflower snow, sticking to all aspects of trees. On the final switchbacks, sunlight hit at near the angle of the slope revealing a rough surface to the snow [surface hoar?]. The summit itself was pretty windy and warm. Snow was heavily wind compressed (not scoured) and only 2–3” deep of crunchy, hard snow. 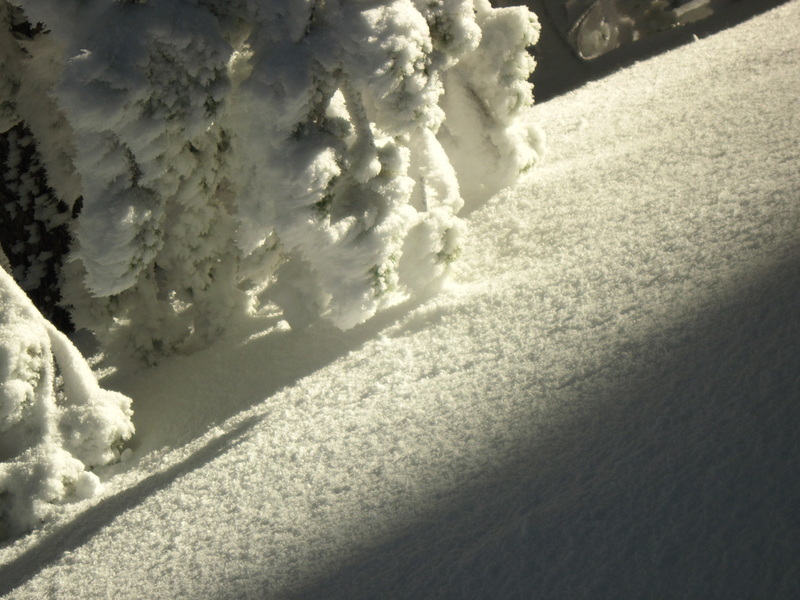 On the final switchbacks, sunlight hit at near the angle of the slope revealing a rough surface to the snow [facets?]. The top 200’ North face is awesome and deep. Once at the “tree line” stick to the northeast (trail area or Lamel Springs gully). I took the North ridge and it was pretty low-tide; I got quite a few dings. Either way, below 8000’ it is too shallow to board/ski. Bring your dedicated rockboard/rockskis. You won’t be disappointed. "The Face" (8000' NW aspect): This run spits you out on Hwy 2, just west of the bridge. It looked awesome from up top, but I had seen (looking from the road, up) it would become too shallow. Rough snow on the final switchbacks. Not really gaupel, they didn't tinkle like surface hoar. But they were fragile and sugary.